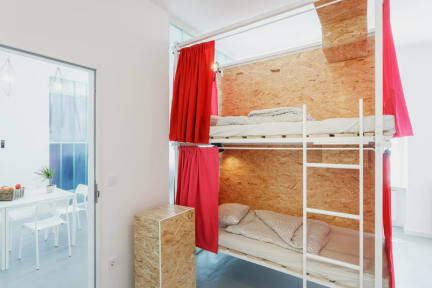 Avenue Hostel v Budapest, Maďarsko: Zarezervujte nyní! We accept groups up to 260 people. Avenue hostel boasts a fully equipped main kitchen, communal and private bathrooms, unique design, dormitory rooms with lockers, privacy curtains, reading lamps, and power points in your sleeping pod. Cleverly designed communal areas make it easy to relax, get to know follow travellers, or even work. No curfew for those who like to party, and quiet hours for those who like to sleep, 24 hour reception, free Wi Fi, free lockers, are but a few of the services on offer. We pride ourselves on the unique and cosy atmosphere we have created. At Avenue hostel we have put a lot of thought into what you need as a traveller: comfort, amenities, relaxation, and security. It doesn't matter what kind of traveler you are, our facilities and expertise are all geared to cater to your needs and we aim to make sure that your stay in Budapest whether it's long or short will be the best experience you could hope for. We have rooms for every budget, from comfortable and spacious 12 bed dorms to private 4 bed dorms. We also provide great deals and offers for our guests ranging from VIP spa tickets, to Yoga classes, pub crawls and so much more.